Today marks the start of Scottish Food & Drink Fortnight, so it seems a fitting occasion to showcase one of our great local producers. 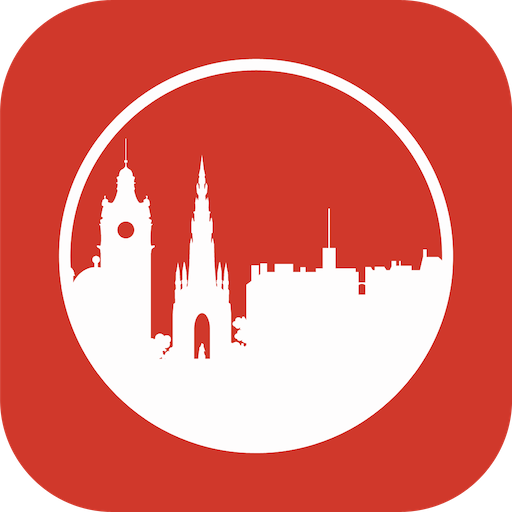 MJ had spotted that Mellis was now offering sandwiches, when she was wandering up Victoria Street, probably after spending a little while pining after tweed at Walker Slater, the other day. 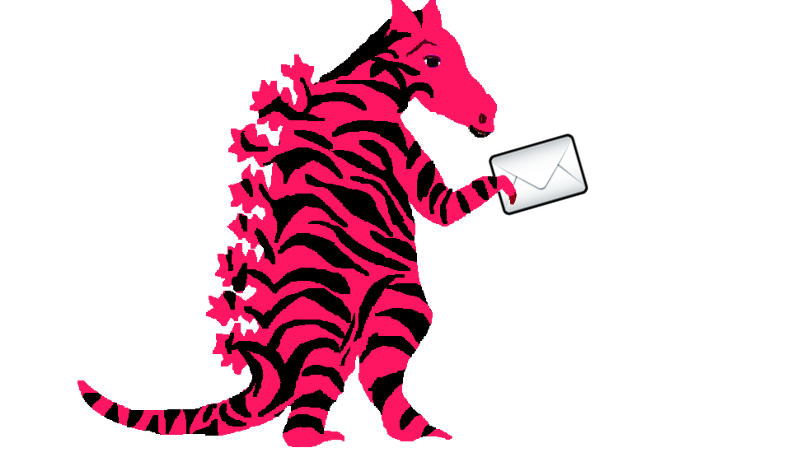 For those uninitiated, I.J. 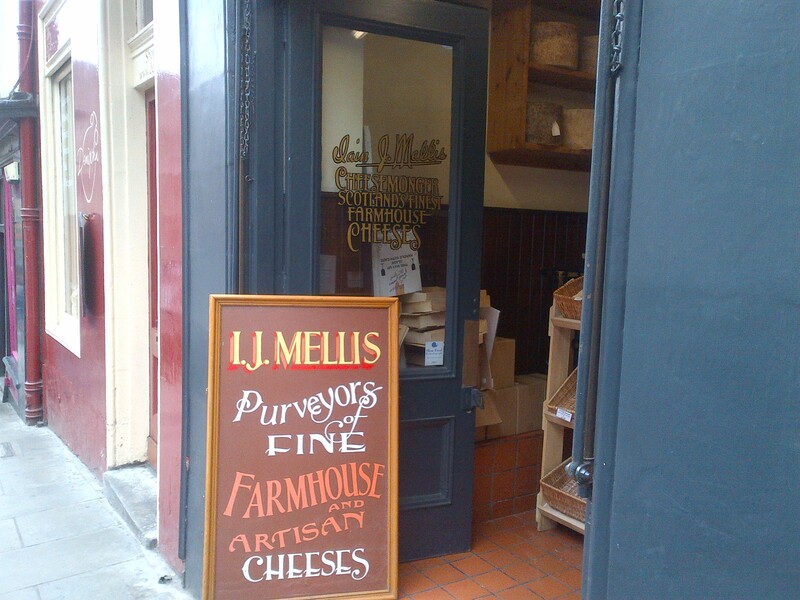 Mellis is a fine purveyor of cheeses, with branches across Scotland. With wholesale and retail arms, if you haven’t been to one of their shops, there’s a good chance you’ve eaten their cheeses in a restaurant. In my case, the last time I sampled some of their excellent produce was at a wedding, at The Bonham, where the cake was a three-tier cheese creation, with glorious wheels of manchego, Wensleydale and blue cheese. It was truly outstanding. Their sandwiches are a new innovation, having just started to be offered during this year’s Festival. The friendly counter man asked whether I thought they should keep them on, all year round. Based on today’s visit, the answer is a resounding “yes”. 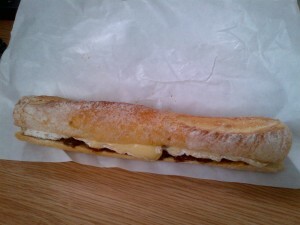 My choice was a brie and fig relish baguette, which was freshly made to order. It was generously stocked with both fillings, and the baguette itself was delightfully fresh. It made for very tasty eating, with the excellent cheese matched with a beautifully tangy relish. It pleased me, muchly. 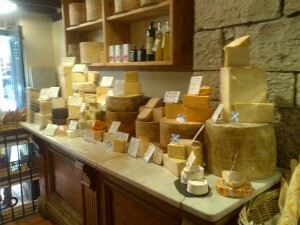 The cheese shop setting is just lovely, with a dizzying array of cheeses on offer. It was my first visit to their compact little Victoria Street shop, and I did well to get out of the shop without picking up a little something to nibble on, later in the day. So overall, the sandwiches from Mellis are really good, and should form part of their year-round offering. 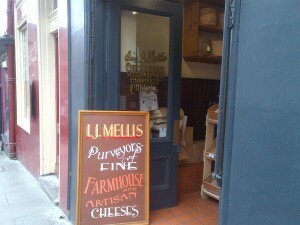 Aside from anything else, it’s a great way to get folks into the shop, and once inside, the heady aroma of artisan cheese majesty is highly likely to work its magic. I’d make time in your schedule for a visit, soon.